Which are the best slots based on TV shows? I love playing online slots, but every now and then I need my live casino fix. This past weekend, I took a trip to Atlantic City to check out the gaming scene. I had been back in the late winter, and to be honest, Atlantic City was pretty much a ghost town a few months ago. The beach was empty (understandably so), but a lot of the casinos were empty too. Back then, the seaside resort town was still in shock from the closure of four big casinos. But today, many casinos are not only profitable, but thriving. The scene on the boardwalk was very different than last time. The beaches were packed with sunbathers and the the boardwalk was bustling with families, college kids, and young adults looking to have a blast. But it was what was inside the casinos that impressed me the most. 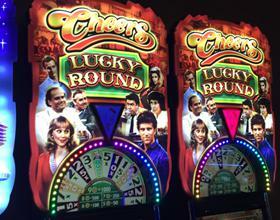 Some of my favorite TV shows have their very own casino games, many of which are not available online at all. Here’s a look at my five favorites. Playing in a casino is actually a lot like being a cast member on the set of Cheers. Think about it. If you’re into Roulette or Craps, you’re a lot like Sam or Woody, standing up all day. And if you prefer table games or slots, you’re pretty much the casino version of Norm and Cliff, sitting down and rarely getting up, assuming you’re on a lucky streak. So seeing a Cheers themed online slots game that revolves around rounds of drinks at everyone’s favorite Boston bar was fitting. Make no mistake, though. While the TV show is more than three decades old, the slots game is very new, featuring video clips and all the bells and whistles of a modern video slot machine. Carrie, Samantha, Charlotte, and Miranda star in this slots game based on the most popular HBO show of all time, and an all time favorite show among women. You’ll feel like you’re living it up and socializing with good friends in New York as you go on your quest for the perfect shoes, martinis, and that ring from Mr. Big. If you like this game, you might like High Fashion at Palace of Chance. Growing up, I loved watching Wheel of Fortune. It was the one game I could wrap my head around. And, perhaps, my love for Wheel of Fortune got me into casino games. After all, the wheel is a lot like a Roulette wheel (which explains why Roulette is one of my favorite games). The live version of Wheel of Fortune does a great job of simulating the game show. And with the Super Spin feature, you get to spin that big wheel and feel like you’re on the show. 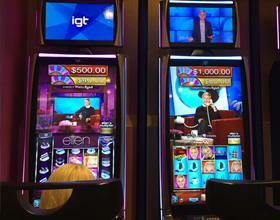 We never thought we’d see the day when a talk show host would have her own slots game, but Ellen is always full of surprises on TV. This slot machine really capitalizes on the quick whit and hilarity of the comedian, complete with video clips and iconic images from the daytime talk show. And you’ve got the chance to win big, just as you can on her TV show. Sometimes, playing in a casino feels a lot like trying not to get booted off an island. One wrong bet or not using your bankroll correctly could land you outside the casino floor, or at least back at the ATM. The Survivor slots game takes the concept of surviving to a whole new level by paying you out when you win those challenges. Definitely worth playing whether you’re a fan of the show or not. At Palace of Chance we have games modeled after TV classics too, like The Three Stooges Brideless Groom, for example. Check out our full collection of online slots games and discover your new favorite.